Writers really are an awesome bunch of people. Having returned from #genrecon in Brisbane, there’s one word that sticks in my mind which came through strongly during the three-day convention – inspirational. Not only was I inspired by the presentations and workshops held during #genrecon, but also the fellow writers – some of which I’d been networking with for a long time, but only met for the first time. Every writer I met had a novel in the works or was pitching one to an agent at the con. Sadly, I wasn’t one of them, but I fully intend on changing that status in the near future. The collection of horror writers wasn’t as large as say, the romance or fantasy writers at the con, but what we lacked in numbers we made up for in enthusiasm. It was fantastic to gather with a group of like-minded people and share thoughts on why we loved the genre so much. I met many amazing authors at the con – and even a very enthusiastic librarian who had a keen interest in horror. I left feeling invigorated and inspired to pursue my dreams even further and perhaps very soon I too will have a novel to pitch at a future con. Thanks to all the Genrecon organisers and fellow writers Cameron Trost, Marty Young, Ben Payne, Stacey Larner, Helen Stubbs, Jodi Cleghorn, Cat Sparks, Robert Hood, Stephen M. Irwin and Gary Kemble for making it a memorable weekend! 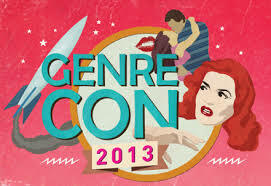 Visit http://www.genrecon.com.au for more information on the con. This entry was posted in Uncategorized and tagged Genrecon. Bookmark the permalink.